RECOMMENDED VALVE TIMING The description beloew was the best MIVEC setting that TOMEI found during the engine bench test. Actual settings will vary from car to car depending on the cars location and setup. * The 4B11 Type-R test is based on 100 Octane RON fuel at each RPM range. Advanced settings is required for optimum results. We had spent extensive time with R&D on these camshafts, with various testing on all type of combinations and prototypes. So many in fact that by the time we had released these cams, the 4B11 & EVO 10 had already been out on the market for 2 years. With materials especially selected for this engine, special profile designs and manufacturing process just specifically for this engine. So all EVO 10 customers can rest assured that satisfaction will be delivered with these camshafts. 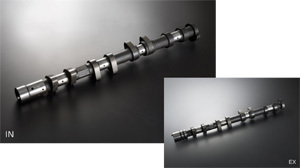 Our camshafts retain the original MIVEC feature, and maximises the MIVEC potential in all areas.